Create a list of the things that you want improved or changed in your home. Be specific. Also, prioritize your wishes, is the master bathroom remodel or the kids bathroom remodel more important? You know the old saying, "A picture is worth a thousand words." Well it really is. Find pictures of things you like. This will help the contractor know the style that you want created in your home. Look through magazines and create a folder of things you see that you like and would want incorporated into your home. If there is a paint color on a wall that you are particularly fond of in a picture take note of it. Or if you visit a friend's house and really like their wall color, ask them what it is. An amazing new resource available online is the website houzz, it's like having thousands of design magazines or model homes at your fingertips. 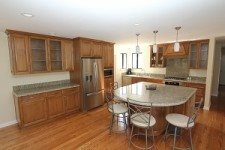 This website allows you to browse through thousands of pictures of different homes. You can then create an ideabook where you can store all of the photos you like. Then when your contractor comes to visit simply pull up your ideabook on your computer and you can show them exactly what you like. You can create many different ideabooks within your account, for example, you could have a kitchen ideabook, bathroom ideabook, etc. As you search houzz be specific in your searches. If you want a new tile back splash with subway tiles, search - backsplash + subway tiles. The more specific you are the better chance you will have of finding what you want. Or may be you aren't sure what you want...just take some time and browse through kitchens, making note of things you really like and then go back and be specific in your searches. You don't need to have the design and all your wants formulated before you call your contractor, that's part of his job too, he is there to help you come up with what would work best for your space. But it does help if you can give the contractor something to build on. Be realistic. If you want a new kitchen, complete with cabinets, granite countertops, and flooring you won't get it for $5,000. Sure, those home improvements shows may do it for that but they aren't paying for the labor and often times they get things donated in exchange for advertising on their shows. Having a ballpark amount of how much you are willing to spend on the improvements in your home can help your contractor steer you in the right direction. He will be able to give suggestions to help you make the best use of your money. May be you want and or need all new appliances if your kitchen, are you willing to sacrifice a bit and go with white appliances instead of stainless steel? By being willing to make small changes like this you will find you have the money for the granite countertops you always dreamed of. Find a contractor. Call us here at Build Ventura, (805) 323-5799, we are more than happy to come by and discuss making your dreams a reality. Remember if the price a contractor gives you sounds too good to be true, it probably is. And quality workmanship is worth it's weight in gold.